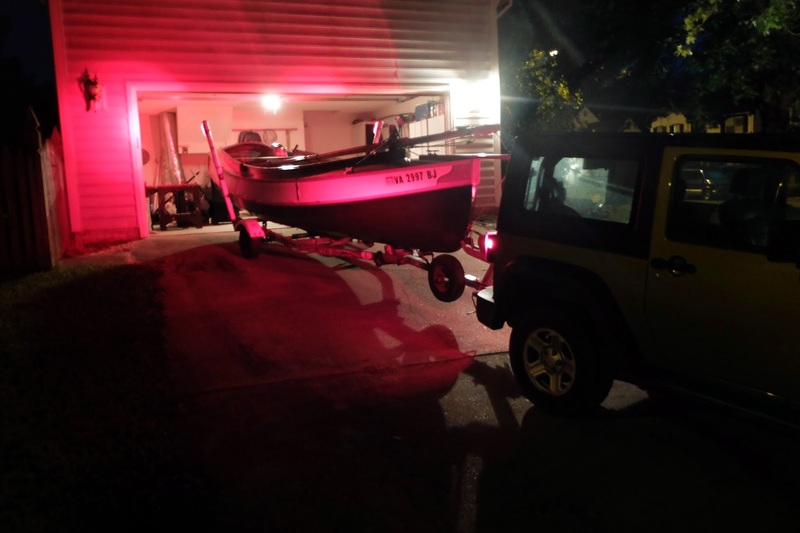 In the glow of the red taillights I hook up the trailer, load the last few pieces of gear. Have I packed everything I need? I wonder about the wind and the weather. 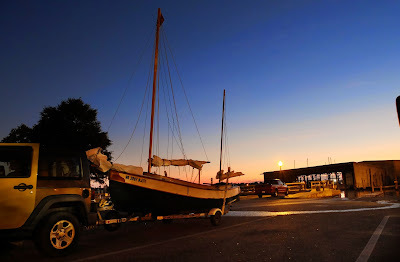 I think about salt spray and the sun, rain and a damp sleeping gear, cameras, batteries and freeze dried meals. And I wonder why I never bothered to measure the miles to Cape Lookout and back. We are on the road in darkness, driving south along the Dismal Swamp Canal, then across the state line into North Carolina and an off-ramp that leads to Elizabeth City. 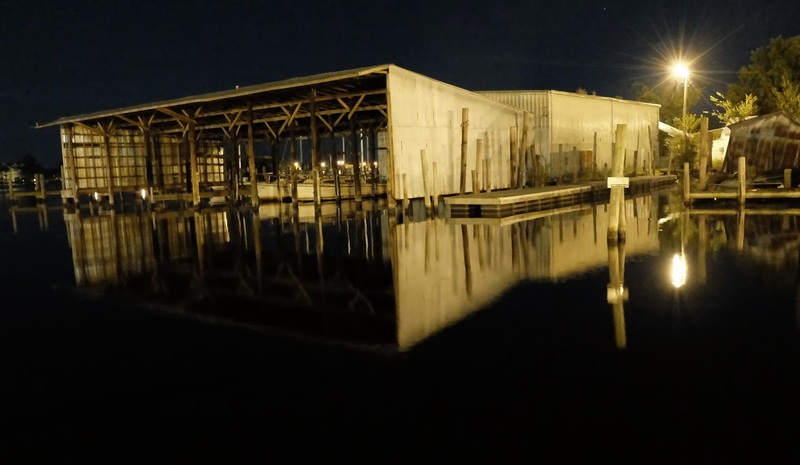 Still dark, the water is glassy at the ramp, the corrugated boathouse across the way is tinted pale yellow by the streetlights. Rigging Spartina in the dark takes longer than I expected. 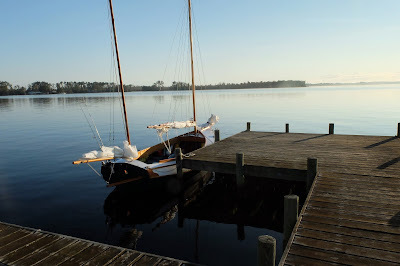 Dew forms on the coaming and decks as I put the cooking kit and boxes of lights and notebooks on board. Spartina slips into the water at dawn. 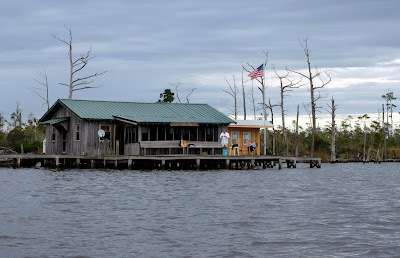 No wind, we motor around the corner of the old boathouse, past the old dock where I kept the original Spartina, past the Elizabeth City Shipyard, now fallen into disrepair, and past the poles jutting up from the river, a project started and never finished. We tie up at Cottage Point where I meet my friend Millie. She gives me a ride to retrieve my jeep and trailer, which I leave near her place. She is worried about me, asking about the weather, telling me “There’s rain in the forecast, you know.” I say “I know,” but I really don’t. 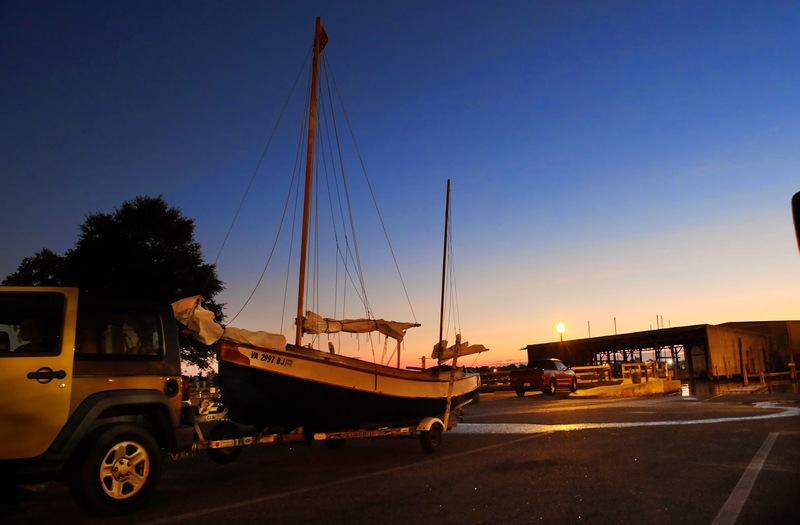 “I’ll be fine, I’ve got a tent.” Pushing away from the dock I am glad to leave everything behind. I turn to wave goodbye and Millie she doesn’t see me. She’s gazing down river to where it opens to Albemarle Sound. Without a breath of wind we motor with sails up. The southern sun is bright and hot, the only clouds are low on the horizon. A sloop headed upriver to the east barely moves. A hint of a breeze stirs a windsock on shore. 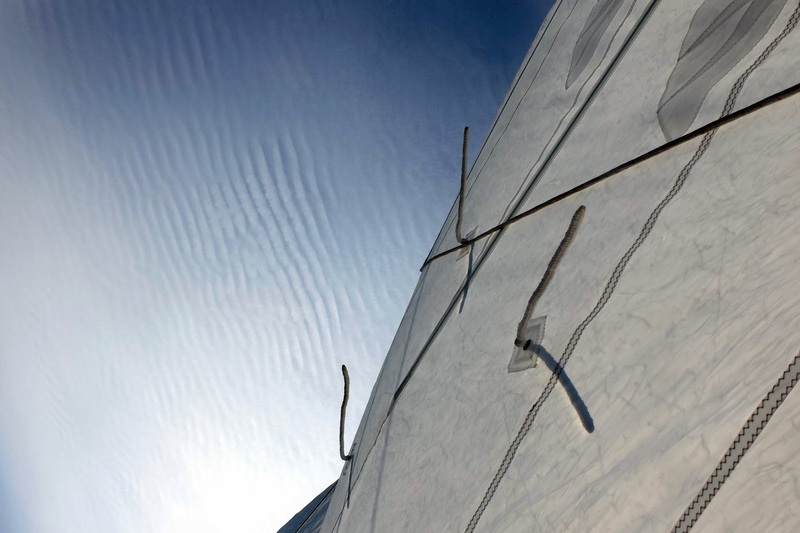 At marker “5” wind ruffles the surface. I try to sail, go back to motoring. Then the wind fills in, we sail at four knots in the cooling breeze. 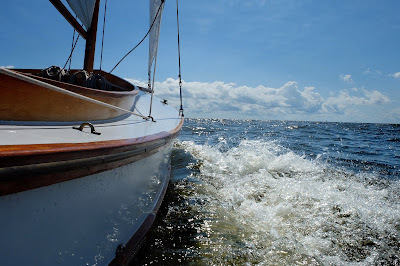 Tacking to Wade Point the centerboard touches the shoal reaching out into the river’s mouth. The wind falls off, returns. Lunch, a can of tuna salad and some dried fruit, while I listen to an Outer Banks radio station. The water is choppy over the shallows, then calmer as we leave the point behind. At noon we are on Albemarle Sound, blue skies giving way to a finely patterned overcast. 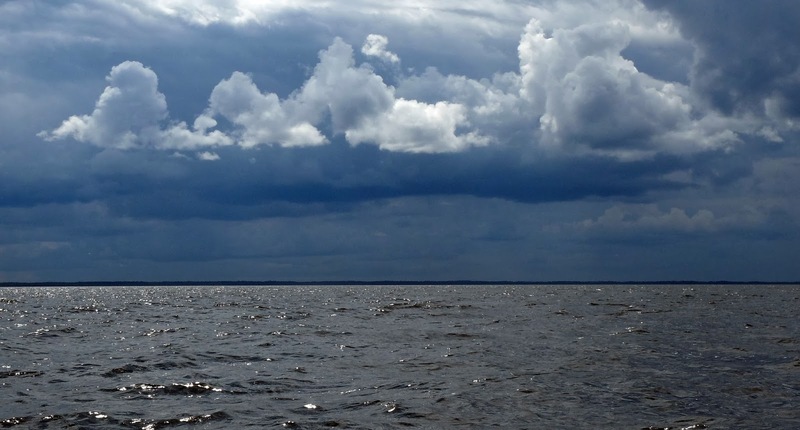 It is a fitful crossing with grey clouds building to the west, the wind coming and going. Three white terns hover against a darkening sky. Patches of rain fall to the southwest and I slip on my foul weather pants. 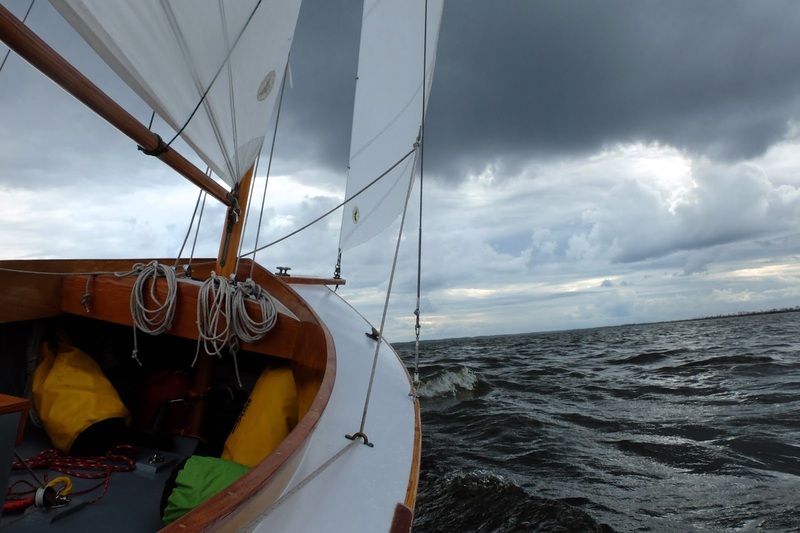 The wind disappears and I bring down the main and jib, the bow pounding in the chop as we approach the southern shore. The wind returns, bringing along a steady rain. 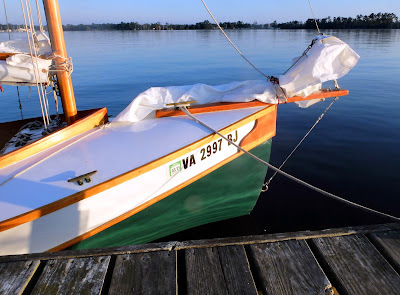 Spartina heels to port and spray jumps out from the bow. We skirt the shoal at the Alligator River’s mouth, sailing east through fields of crab pots, some marked with pink polka dots, then back west past the duck blinds. Sailing east to the Little Alligator River, I see houses on stilts. At one of them a guy plays guitar out on the deck, singing into a microphone for an audience of one. The woman gives a friendly wave. I sail in close to ask about a nearby anchorage. With a flick of his wrist the guy motions me away from his dock. I ask how deep it is by the Great Island just a few hundred yards away. 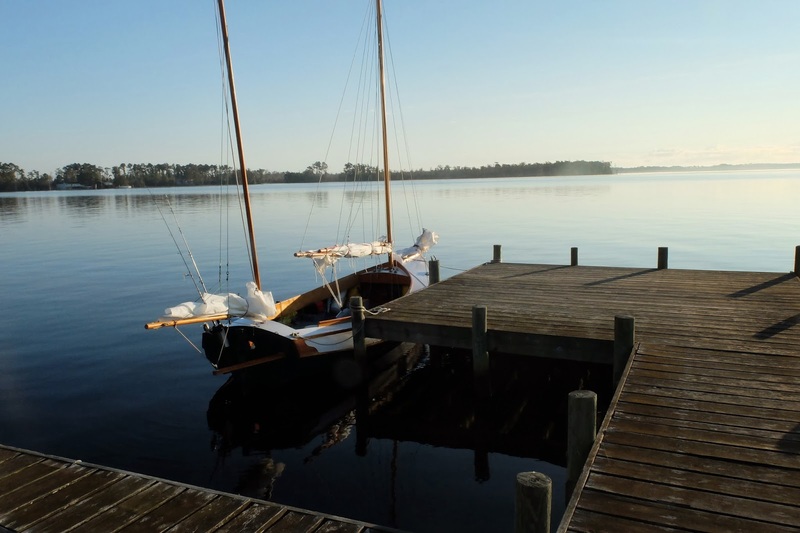 He gives an abrupt answer, pointing to an anchorage a mile to the south. The woman, sitting in a chair off to the side, says I have a pretty boat. I say to her I was sorry to have missed the performance and she laughs. The guy says maybe he'll play another song after I'm gone, then walks away. We sail northwest to my intended anchorage near the island, the wind light and steady, the water calm and skies brightening. Anchor down, I try my first freeze-dried meal - beef stroganoff – and find it to be excellent. The forecast calls for north wind tomorrow, but also rain. 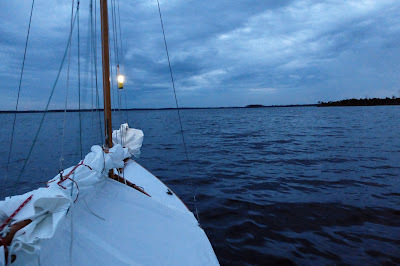 I set up the boom tent, leaving the starboard aft section unhooked so I can sit on the aft deck and enjoy the evening sky darkening to shades of blue and then black.